Location was perfect! Easy access to everything. Very "green" we try but they excell at this and we will learn from them. Friendly and helpful. Rooms are modest but very nice and super clean! We had a pleasant experience at Alto and were very satisfied with our stay. We would almost certainly stay at Alto on our next visit to Melbourne, unless we can find something even better! My stay was short but I'd like to stay again. Overall an excellent experience, especially given the price. Would recommend. very good, but i found the bed was much too hard. Excellent location and good service from staff. We have stayed at the Alto before & love it for it's quiet sophistication and ambience , we always will stay here when we visit Melbourne. Excellent hotel. All staff fantastic through out the property. Please pass on thanks to Andrew at reception who always answered our tourist questions with a smile and with out complaint despite hour basis or silly they were. We both work in our careers in hospitality and if we could steal Andrew to work with us we would! Very good thanks. Staff at reception were very helpful. This was my second stay at the Alto and I have enjoyed and appreciated the faciliies. particularly like the "green" credentials of the hotel. We had a very memorable family holiday enjoying the tennis. The staff were incredibly helpful and the hotel was a pefect location for us and had everything we needed. Lovely. Staff were helpful, the housekeeping staff were polite, accomodating and very efficient which made our stay all that much more simple and pleasurable with a small child. The complimentary coffee and hot chocolate was delightful, and the fantastic shower and personal care products were lovely. had a great stay. staff were excellent. room was small for having a kitchenette. was not really suitable for cooking anything and no table for eating at. great stay and thank you for the room upgrade how ever having the shower over the bath was no good for me as an elderly lady the side of the bath was to high for me to get over . We are glad you liked the upgrade. Only our 1 bedroom spa apartments have a shower over the bath. All other rooms have walk in showers. Good location. Reasonable priced. Friendly staff (excep on during one early morning). It is a great hotel with all convenience facilities in an excellent location. We had a great time to rest. Great! Excellent location. professional staff, always helpful. I love staying at the Alto. My only small negatives are that the bed and the pillows were a little hard and I didn't realise that this type of room had no DVD player. However at such a great price which included the amazing Alto breakfast I can't really complain and will bring my own pillow next time. Thanks for a lovely stay. Staff were very professional and courteous. All services provided were of a very high quality.We will definitely recommend this hotel to others. Well done. loved our stay here, will definitely be back. also appreciate the green initiative, more hotels shd follow yr example. and the staff (esp Pippa, she was very helpful with giving us directions and recommendations) were lovely. will recommend to friends! We also stayed in a one bed apartment for one night and were able to check early into each room. The front desk were extremely friendly, professional and helpful every time we spoke to them. The environmental credentials are an excellent bonus. We would stay again! great experience, very helpful staff. thank-you for letting me leave my bag there while I went shopping. I like your enviro friendly policies as well. Our first visit to Melbourne, would most definitely stay in your hotel again, will most certainly recommend to others as a great place to stay. Very relaxing, cosy environment to come back to after a busy day out sightseeing!! Very friendly helpful staff, thank you! I have stayed with you before and it is a perfect location and staff are always friendly and rooms always beautiful. Definately recommend!! We had a lovely time, and couldn't have asked for a cleaner, more comfortable, better valued room. Staying here was awesome it was a nice small hotel. We got free breakfast which was great except on the last day which was Saturday breakfast was at 730 instead of 7 so we didnt get any since we needed to be at the airport :( We also has a TV issue on the 2nd nite so we couldn't change the volume or channel even when pushing the button on the tv but the next morning Alto staff came by and fixed everything perfectly. However we were missing towels after one cleaning but someone promptly brought them up. 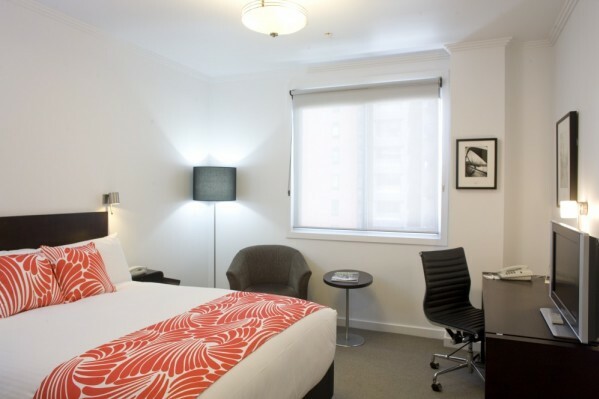 The room is in a great location you can sake the skybus and the hotels a block away and the tram service is like right in front the staff is always willing to help you! We didn't take advantage but they had a relaxation room with two message chairs and a tv. Also they had a nice area in the lobby where there was a free coffee/hot chocolate/ tea machine that was amazing. We also had free wifi up to 500mb per day which was awesome. Overall it was a great place to stay. This is my hotel of choice when I come to Melbourne. I like the retro feel and the attention to detail in the rooms. I really enjoyed my stay. The location was great, and everyone was very nice. The free Wifi in the room was also a big plus. It was perfect. Rooms were very clean, staff was very friendly. Despite the fact that we've arrived quite late on Christmas Eve we were greeted by friendly staff at reception and were given detailed instructions on where to park our car as well as city map and some suggestion on where to have dinner. Our room was quite small and very simple but I knew what to expect from online reviews I read before booking the hotel. Overall the room was very clean but there was a bit of hair in the bathroom (nothing worth calling a cleaning lady but it is my personal pet hate so I still felt a bit disappointed). I loved the fact that CBD and Docklands were within walking distance so we could easily stroll everywhere. Free apples and wonderful library space were a very pleasant bonus at the end of the evening, and the breakfast was lovely. I will definitely recommend this hotel to others looking for a simple, centrally-located accommodation.